Lisbon, the capital of Portugal and the westernmost capital city in continental Europe, is a sunny and historic city, located on the shores of the river Tagus’ large estuary, close to the Atlantic Ocean and to the touristic areas of Cascais and Estoril, Serra da Arrábida, or Sintra. With around 600 thousand inhabitants, Lisbon is the center of a metropolitan area with approximately 2.5 million people. The city has a vibrant cultural life enriched by many museums and heritage sites. Lisbon is also close to a number of natural sites located within a half-hour drive from the city center, such as long sand beaches, a wonderful and typical countryside, or mountains covered by the original Mediterranean maquis. On a one-hour drive distance it is possible to reach the magnificent monasteries and castles in Oeste region. In July, daily average temperatures range from 17°C to 25°C, and the monthly precipitation average is around 3 mm. The Conference will take place at the Faculdade de Ciências Sociais e Humanas (FCSH) of Nova University of Lisbon. The FCSH is the largest Portuguese Higher Education and Research institution in the fields of Social Sciences and Humanities, covering areas such as Communication and Language Sciences, Artistic and Literary Studies, Philosophy, History and Archaeology, Anthropology, Demography, Geography, Sociology, Political Studies and International Relations, and intersections between these disciplines. FCSH pursues teaching and research excellence in those areas, both at the national and international levels, a clear commitment to innovation and interdisciplinarity, the creation, development and dissemination of a humanistic spirit, and the provision of services to the community in its areas of expertise. Internationalization plays a key strategic role in the pursuit of these goals. The Interdisciplinary Centre of Social Sciences of the New University of Lisbon (CICS.NOVA UNL), is the largest Portuguese Higher Education and Research Institution in the fields of Social Sciences and Humanities. CICS.NOVA includes 414 researchers, of which 122 with PhD, and 146 doctoral students. Besides interdisciplinary research another CICS.NOVA added value is the use of geographic information technologies as tools of measurement in the social sciences (i.e., remote sensing, geographic information systems, database, GPS) which creates conditions for modelling spatial and social phenomena and spatial simulation. The strategic research plan of CICS.NOVA is based on the necessity to take up the complex challenge of linking scientific activity, teaching and extension activities and provides a forum for the debate and development of innovative research methods and methodological approaches in the social sciences. Lisbon’s international airport is only 7 km away from the city centre. And less than 5km from the venue of the Conference. A simple and cheap way of getting from the airport to the city centre is by subway (info below). Also by Bus. AeroBus, the Lisbon Airport Transfer Bus, with regular links between airport and important points in the city center, which include bus and train stations. This custom service is composed of dedicated and helpful staff, free Wi-Fi, USB chargers and stops at the main hotels, running daily between 7:30am and 11pm. Taxis are available 24-hours a day, the journey time to the city centre lasts 15-30 minutes and costs between 10-15 EUR. Visitors who arrive by train will get off at Oriente station or at Santa Apolónia station, just a few minutes away from the old centre of Lisbon. Both stations are connected to the Lisbon subway, so the visitors can use the subway or the Carris buses. There is a wide inexpensive network of public transportation in Lisbon, including bus, subway, elevators, electric trams or trains, within the city or to the suburbs. Bus and tram tickets can be purchased at any ticket vendor or directly from the driver. In this case the ticket is more expensive. Subway tickets must be purchased at the subway stations. There are passes for bus/tram/subway trips valid for 30 days, as well as prepaid rechargeable travel cards. The Zapping card can be used across the different transport networks in the city and outskirts, namely in trains (CP-Comboios de Portugal), boats (Transtejo), buses (Carris) and Lisbon underground (Metro de Lisboa). This rechargeable card can be purchased in all transport operators point of sale and in Payshop Agents (€ 0.50). - Multiple charges of € 5, up to a maximum card balance of € 40. 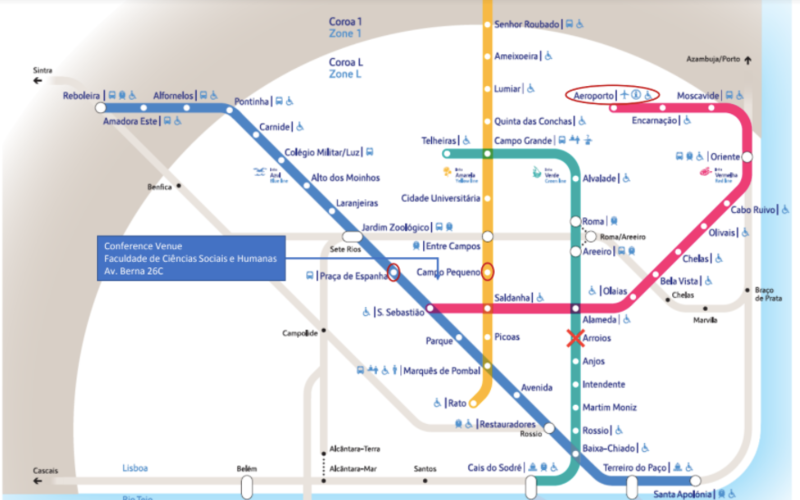 A one-day ticket Carris/Metro costs €6.15 and is valid for an unlimited number of journeys throughout the Carris (bus/tram/elevator) and Metro networks for 24 hours after validation. The public bus and tram company CARRIS covers almost all the city of Lisbon. Generally, buses and trams run from 6.00 am to 11.00 pm, there are fewer buses after this hour, but the service lasts until 4.00 am. During the weekend transportation services are reduced substantially. The subway – Metropolitano de Lisboa – is the easiest and fastest way to get around the city and runs from 6.00 am to 1.00 am. 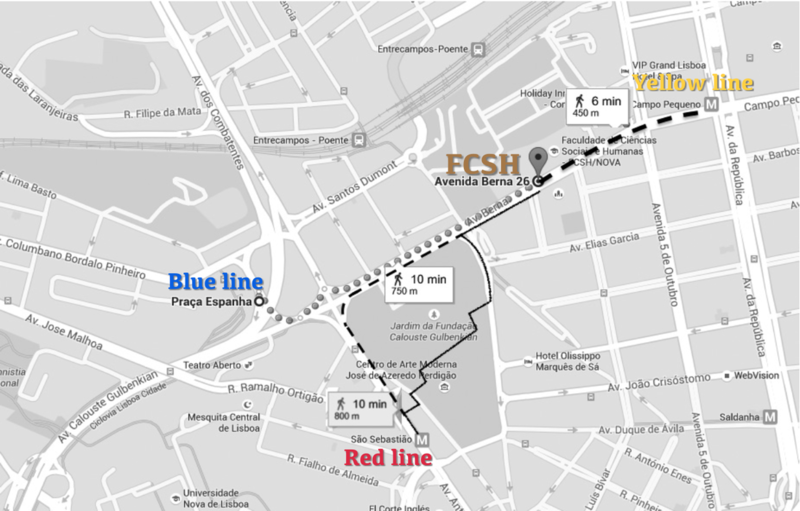 * The stations closest to the conference venue are Campo Pequeno (yellow line), Praça de Espanha (blue line) or São Sebastião (blue and red line). Before hopping on the metro you must buy an electronic ticket, Viva Viagem. The card itself costs 50 cents and can be bought at the ticket o ce or using the vending machines. Upon charging the card, keep the receipt as it may be useful if you need to change a damaged card. A ticket exclusively for the metro can only be charged up to €20. You can check your card balance using the machines, choosing the option carregamento/leitura. A single ticket costs €1.45 and is valid for one journey, after validation, throughout the metro. *Tip: recharge your card with the approximate number of trips in mind, as you get a small bonus each time you charge it with more than €5. Taxi apps have been slow to catch on in Lisbon, but 99Taxis, ﻿MyTaxi﻿,Taxyfy and Uber are available. Taxis are a good way of getting around. Lisbon taxis are cheap. Taxi fares are calculated on the basis of an initial at charge, currently €3.25. If luggage is carried (bigger than 55x35x20cm) a further €1.60 is charged. The call-out is charged at €0.80. A journey from the airport to most locations in central Lisbon should not cost more than €12 plus any baggage and call-out charges. Meters are displayed in all licensed taxis so the fare should not come as a shock. Tips are voluntary: 10% is the norm. Lisbon local taxis charge 20% more after 22:00 and on weekends (using Rate 2 rather than Rate 1). The fare outside of the city is calculated on a km basis upon leaving the city limits, about €0.47/km, and any motorway/bridge tolls are paid by the client. When taking a cab, try to enquire about the price to your destination rst. Save your receipt and check if the license plate matches the receipt details. See if the meter is running and rate code is correct. Opening hours for shops and businesses across Portugal are usually 09:30 to 19:30, Monday to Saturday. Malls close late (23:00 or midnight) daily. Cafés tend to open from 08:00 or 09:00 until 20:00 daily; restaurants 12:00-15:00 and 19:00-22:00 daily; banks 08:30 to 15:00 (Monday to Friday); pharmacies 09:00 to 20:00, Monday to Friday; and supermarkets 09:30 to 20:30 daily.